Last weekend I was in the Tulsa area for my dad’s wedding. Now, my trips to Tulsa are few and far between so I try to make the most out of each trip. And by, “making the most of each trip”, I mean eating at all the places we do not have in Oklahoma City. Chief among those places is Coney Islander. That simple formula only equates to chili dogs, and sadly, that is all I have found in OKC. Yes, the Coney Island in downtown is a great place to eat, especially on a cold and overcast day, but those are chili dogs. Very delicious and satisfying, as they may be they are still a different breed. No friends, there is more to the mystical coney than the basic ingredients one assumes. We begin our introduction to real coneys at what I like to call, The Coney Chute: a narrow passage which leads you from the door to your first stop. Here you grab a tray, and cup, selecting the fountain drink of your choice and filling up. Tip: they charge for refills so skip the ice, the pop is cold anyway. As you slide to the next stop on the Coney Chute you finally see where that glorious smell was coming from. Before you, behind a glass shield, is a giant griddle full of small wieners. 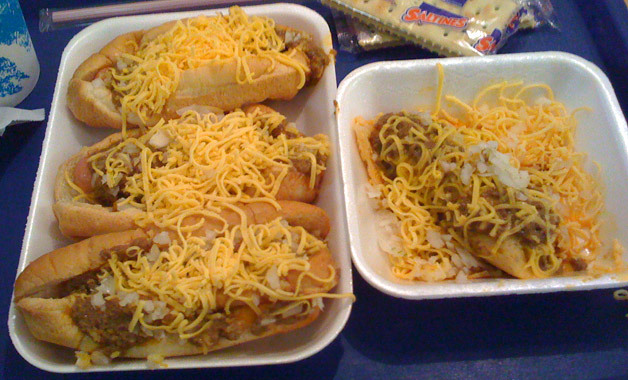 This is where the first difference between chili dogs and coneys can be seen. 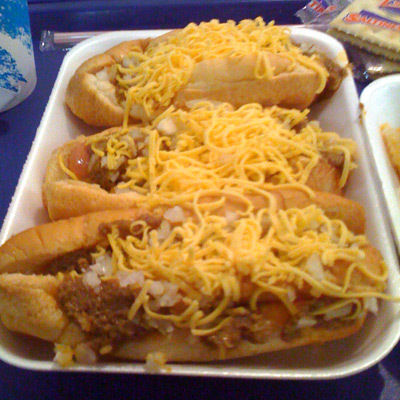 Unlike chili dogs which are of normal size and boiled, coneys are smaller and grilled to give them a nice snap. This is also where you are asked what you would like to eat. Don’t dilly dally unless you want to face the ire of those behind you. You know what you have come here for and that’s coneys. This is not the time to back down or be one of those chumps that refuses to try a place’s specialty as it was intended. This is not the time to worry about calories or silly aversions to things like onions. No, now is the time to not be that guy and order with confidence, “(x) with everything.” I usually go with 3, since they are smaller than chili dogs. I forgot to mention this is where you can grab a bag of chips. I think Cheetos pair best with coneys. Finally we come to the last stop in the Coney Chute where you pay (credit cards accepted) and are finally presented heaven on a bun. I know the temptation to inhale the coneys the second you are seated is great, but take a second to check out the condiments in front of you. You won’t find mustard or ketchup on your table, but you will find all kinds of fiery goodness. Louisiana Hot Sauce, Trappey’s Pepper Sauce and what I think is the essential coney condiment, the red pepper shaker. There is some debate among my friends and family as to what mixture in the shaker is, but we are all pretty sure it is mostly paprika and cheyenne pepper. This being your first time around, go with just the red pepper shaker, dusting the top of the coneys. Now, dig in. Taste it? Now do you taste the difference? The chili is more like a sauce than the chunky bean laden chili you are used to eating. It is also spiced differently, with what I think is probably cinnamon. The soft steamed bun is like a delicious pillow for your tongue. The cheese is finely grated, and the onions are cut to the point of being more like a relish. There is the subtle taste of the mustard coming through, and it is all finished with a light heat on lips from the red pepper dusted on top. So incredibly good. Now that you have graduated to the world of real coneys, on your next trip I would suggest trying a tamale with everything, as pictured left, next to the coneys. They also serve 3-Way, spaghetti with chili and cheese, which is also mind blowingly good. Of course you can get just a bowl of chili topped with cheese and onions and comes with crackers. I have only done this once and am shocked that have haven’t done so again. 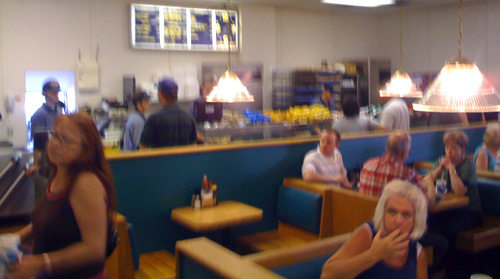 There are probably other things on the menu, but with coneys that good, it is hard to deviate from perfection. One last look at the Coney Chute before leaving. Goodbye Coney Islander, we will meet again soon. And goodbye white haired lady who is staring at me as I snap this photo. Since I have not had Coney Islander in Tulsa, I can only guess that it is similar to Cincinnatti Chili. It's unique ingredient is cinnamon. Wonderful. It's actually a Greek dish, and when the Greek guy arrived in America and started serving this, he decided that the closest comparison might be chili, so that's what he called his dish. I've heard it is pretty much the same. I didn't know the Greek origin though. It makes for a great chili and I would love to know the recipe. I used to think it was Tulsa that I missed...all this time it was just the coneys. Delish. 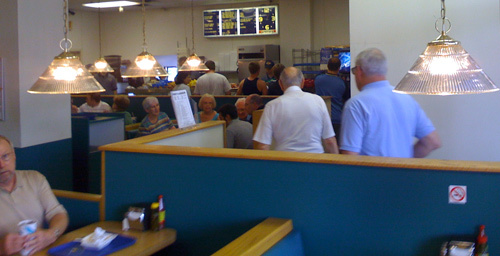 Apparently, coneys are REALLY popular in Detroit. I've never seen so many restaurants dedicated to a style of food which wasn't the main stuff: pizza, Mexican, Italian, etc. I've enjoyed them twice so far, and although they are nothing compared to the Cincinnatti style, they are still pretty good. Cheese is missing, though. Lots of chili and onions, and always natural casings on the dogs, which makes all the difference.